Black Ice Software - Tiff Viewer version 11.56 is released! Tiff Viewer version 11.56 is released! 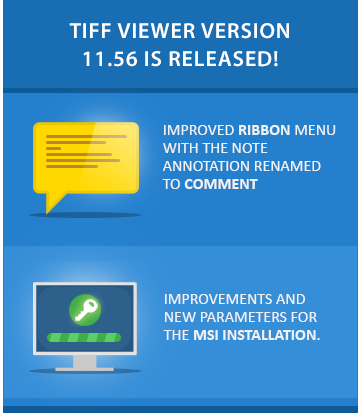 Version 11.56 of the Tiff Viewer is released! Improvements to the User Interface and MSI installer for large scale deployment! Black Ice Software has released version 11.56 of the Tiff Viewer. This version includes an improved Ribbon menu with the Note annotation renamed to Comment, to better reflect the feature’s functionality. The latest TIFF Viewer also includes an improved MSI installer with a new FORCEI parameter. The FORCEI parameter can be used to ignore a damaged SID (Security Identifier of a User) parameter and force the installation even if there are damaged User Profiles located on the computer. The latest Tiff Viewer MSI Installer also includes extended logging information for the CUSTOMINI parameter, allowing Administrators and System Integrators to troubleshoot any issues occurring with their customized INI file. For TIFF Viewer MSI installer availability, please contact sales@blackice.com.